And yet, at one point, cows roaming the streets of New York was hardly a rare occurrence. 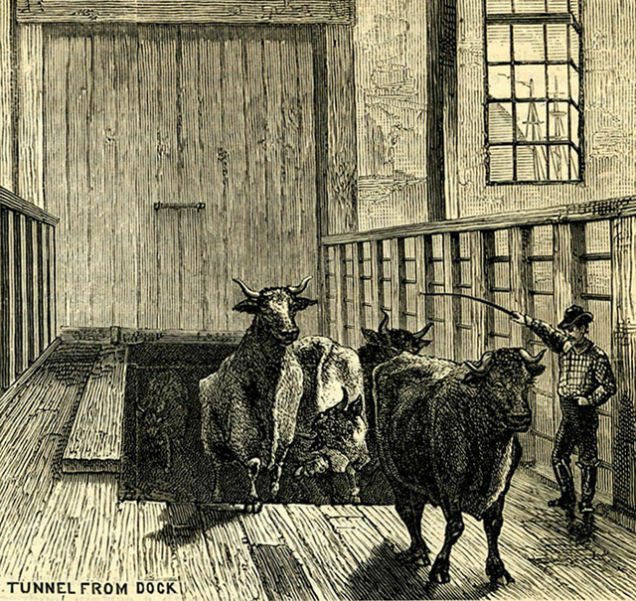 The problem was so significant that the city built the bovines their own thoroughfares, in the form of underground tunnels. Maybe. Starting in around the 1870s, there are various reports of cows clogging the streets of parts of the city. At around that time period, the lower west side of Manhattan turned from a residential area into an industrial one, and over the decades, more than 200 slaughterhouses and meat packing plants opened in the neighborhood. The area, now and since, is known as the “Meatpacking District,” although by the 1970s, the meatpacking industry had fled for other areas (like Queens). But that’s a century of cows coming into the area and steaks coming out. The cows didn’t grow up in New York, though; they were originally from New Jersey. To get the cows to the Meatpacking District meant ferrying them across the Hudson River and them marching them off of ships, onto the docks, and then downtown. The last leg of the path had a problem, though: vehicles — be it horse-drawn carriages or automobiles — also took a similar path. 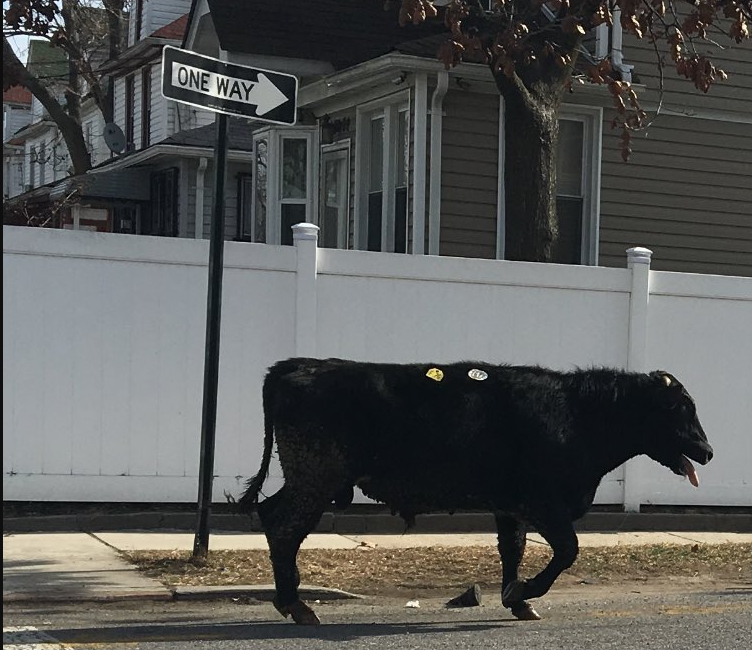 And as yesterday’s rogue cow in Queens proved, cattle can create traffic problems. Rumor has it — and as you’ll see, this isn’t quite confirmed — that the city stepped in by building a bovine subway. No trains or anything like that, just subterranean pathways built for the cattle. The cows made their way down a ramp and out of the way of the people above until they emerged downtown, at their final destination (in more ways than one). The engraving seen above is one of the pieces of evidence of such a feature, although as 99% Invisible notes, it’s hardly a definitive one: “We can’t see where the tunnel is located. And it’s an engraving, not a photograph, so artist interpretation is a factor. And the proportions are all askew—either the cows are giants or the worker is tiny.” One of the other key pieces of evidence — a 1997 article from the now defunct magazine “Tribeca Trib” — suffers from similar ambiguities; per Gizmodo, it cites “a Con Ed inspector named Fred” (no last name given) and otherwise gives only an anecdotal account of the tunnels’ existence — Fred once saw some guys installing some stuff which kind of, sort of, suggested that cows could be below. It’s the stuff urban legends are made of, not history. But the trail doesn’t stop there. In 2004, the City began exploring the possibility of developing an underused section of Manhattan known as Hudson Yards which sits about under where these mythic cow tunnels would otherwise run. (If you can recall, you may remember New York’s then-mayor Michael Bloomberg pushing for NYC to get the Olympics; many of the venues would have been built at Hudson Yards.) During the due diligence phase for that development, as Atlas Obscura notes, “an archeological report from the NYC Landmarks Preservation Commission and the New York State Office of Parks, Recreation, and Historic Preservation mentioned underground ‘Cattle Tunnels’ at 34th Street and 38th Street.” Gizmodo followed up on that report and obtained the blueprints and, indeed, the plans called for a tunnel which connected the port area to the neighborhood of the slaughterhouses. Unfortunately, any attempts at an archeological dig to find these cow paths would be foolish — digging up the city to look for these historical trivialities would cause more damage than our curiosity is worth. And it’s very likely that the cow tunnels are long gone anyway, as the construction of the often large buildings in the area would likely have eradicated them. Instead, cows roaming the streets of Queens are our best hope for such diversions. Bonus fact: The Queens cow didn’t survive its excursion — authorities shot it with a tranquilizer and the bull ended up dying during transport. (It’s going to be cremated, not butchered.) However, other runaways have found more success. One famous(-ish) example: in 1995, a cow named Emily hopped a 5-foot (1.5m) fence in Massachusetts, escaping the abattoir just moments before her scheduled slaughter. Emily, per Wikipedia, evaded capture for 40 days. Her fame well-earned, her freedom came next: a family of (coincidentally) newly-minted vegetarians purchased her from the slaughterhouse and allowed Emily to live the rest of her days under their protection. Emily died in 2003. From the Archives: Cow Magnets: How magnets save cows lives.